Bangkok has two seasons: the rainy season and the dry season. The dry season runs from around November to March. At this time of year, there is much less rain than during the rainy season although there are occasional rainy days. The temperature is cooler during the dry season, although it can still be hot and humid. This is the peak season so most tourists visit at this time of the year. The rainy season does not mean that it rains every day all day long - it just means that there’s a higher chance of rain. Hotels offer great deals during the rainy season which is the best time to visit Bangkok, Thailand for the budget traveler. January is the driest month of the year in Bangkok with just 10 mm of expected rainfall. The tropical weather is certainly evident with the average high temperatures at a sweat inducing 90°F (33°C). The evenings offer a respite from the heat with cool average low temperatures of 70°F (21°C). In February, the low temperature rises a few degrees to 73°F (23°C). On the other hand, the high temperatures rise by just one degree to 91°F (33°C). Bangkok Weather in March: Rainfall is relatively low in March with a precipitation average of 50 mm. The average high and average low temperatures range between 93°F (34°C) and 77°F (25°C). April is the hottest month of the year with a high temperature average of 95°F (35°C). It’s peak season in Bangkok with April being the best month to hit the beaches as the sea temperature is 86°F (30°C). Meanwhile, the low temperature average is 79°F (26°C). In May the average high temperature and the average low temperature measure in at 93°F (34°C) and 79°F (26°C) respectively. Bangkok Weather in June: Bangkok receives a moderate amount of rain in June at 180 mm. The high temperature decreases a few degrees to 91°F (33°C) while the low temperature stays at the same at 79°F (26°C). In July, both the average high and the average low temperatures remain at the same at 91°F (33°C) and 79°F (26°C). August sees shorter days with just 5 hours of daily average sunshine. Despite this, the temperatures remain the same with 91°F (33°C) for the high temperature average and 79°F (26°C) for the low temperature average. Bangkok Weather in September: Bangkok receives the most rain of the year in September with 220 mm of rainfall. There are small shifts in temperatures as the average high temperature decreases by a single degree to 90°F (32°C) and the average low temperature goes down by a couple of degrees to 77°F (25°C). October sees the high and low temperature averages hold steady at 90°F (32°C) and 77°F (25°C) respectively. Bangkok receives more sunlight with an average of 6 hours of daily sunshine. In November, the average high temperature decreases by a few degrees to 88°F (31°C) alongside the average low temperature which goes down to 75°F (24°C). Rainfall is quite low with a 40 mm precipitation average. Bangkok Weather in December: It’s a sunny month for Bangkok in December with a 9 hour daily sunshine average, the highest in the year. In contrast, it’s the coldest month of the year with a low temperature average of 70°F (21°C) and a high temperature average of 88°F (31°C). 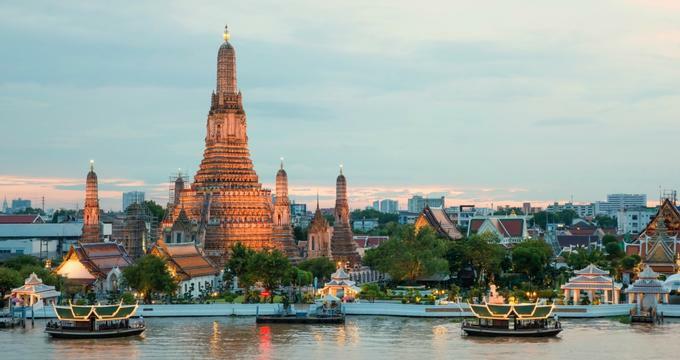 Arguably the best time to visit Bangkok is between late October and March when the humidity and precipitation levels are at the lowest in the year. For travelers who just want to avoid the crowds, it’s best to visit from April through mid-October as the rainy season picks up and the tourist season dies down. During this time, travel and tourism in the city is cheap and there are great deals to be had at many locations. Those who want to experience the magic of Songkran should visit in April while those eager to participate in the Bangkok Price Festival or Loy Krathong should plan to visit in November. There are several ways to get from the two airports into downtown Bangkok. From Don Muang there are taxis, limousines, and public buses. The bus system can be difficult for the first time visitor. 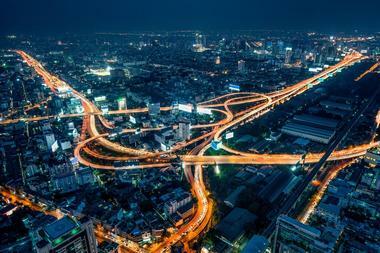 The Suvarnabhumi International Airport offers several ways to get into the city. By taxi it takes about an hour to get to downtown; it can take 90 minutes or more if there is heavy rain or heavy traffic. The City Line is a train line that has a station at the airport. This train is very inexpensive, new, and not expensive. Some hotels offer free shuttle buses. 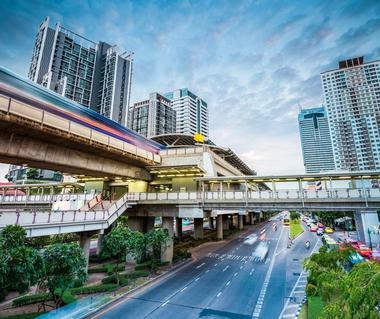 Bangkok’s Skytrain and Metro system are the best ways to get around the city. The Skytrain, known as BTS, is a raised train system that is convenient and not expensive. You can pay per ride or buy a one day pass. The Metro is known as the MRT and is an underground train system. Like the Skytrain, the Metro is easy to use and not expensive. The two systems are not connected, but there are some stations for one system that are close to stations for the other system. The bus system is mostly used by locals. There are riverboats that are used for public transportation, but tourists can enjoy riding on these as well. There are several other ways to get around Bangkok. Taxis are everywhere and are easily hailed. Make sure that you choose an official taxi and ask for the driver to use the meter. Tuk-tuks are three wheeled, open-sided vehicles powered by a motorcycle engine. They do not have meters so fares should be negotiated before you begin your trip. On just about every street corner you will find motorcycle taxis. A motorcycle taxi is an inexpensive and quick way to get around Bangkok. Fares are negotiated before you start your trip. Seeing Bangkok on foot is not easy, and don’t even think about driving. Thai cuisine is famous all around the world. For some people Thai food is their favorite kind of food. 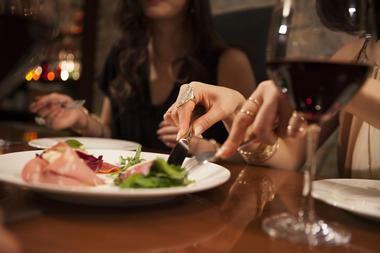 It is one of the most flavorful cuisines in the world. But what you taste in Thai restaurants at home is not the same as what you will experience in Bangkok: it’s the real thing! Thai food can be so spicy for visitors that they’ll feel like their tongue is on fire, so you might want to ask for your dish to be mild: try that first and then you can try medium the next time. There are posh restaurants, but try some of the simple dishes on the street food carts. There are many different reasons to visit Bangkok: the sights, the food, the culture, and more. 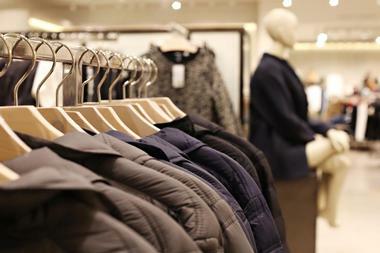 But one thing that is especially attractive to some visitors is the shopping experiences. There are big high-end department stores and shopping plazas such as CentralWorld, Emporium, Erawan, and Siam Paragon. Near the upscale Oriental Hotel is an area full of high-end shops, antique shops, and stores selling silver and carpets. Jim Thompson is famous for beautiful silk and there are several Jim Thomson shops in Bangkok. 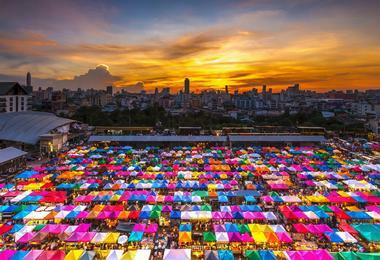 Bangkok is well-known for its night markets. These pop up at various locations around the city. 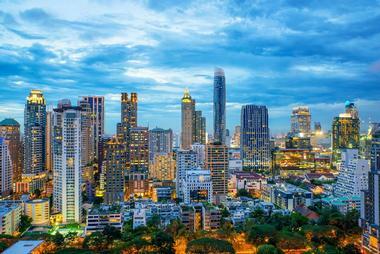 Bangkok is fairly spread out and is made up of a large number of neighborhoods. Some of these will be of more interest to visitors than other neighborhoods. Along the river near the Oriental Hotel there are colonial buildings and churches along with shops selling antiques, gold, and silver. Banglampoo and the Historic District is home to the Grand Palace, the famous temple called Wat Po, the Dusit Zoo, the National Theater and Library, and the Vimanmek Palace Museum. Chinatown is along the river and just west of the Grand Palace area: it is a maze of shops and eateries. Because of the beauty of the country, Thailand, including Bangkok, has become a popular place for weddings. 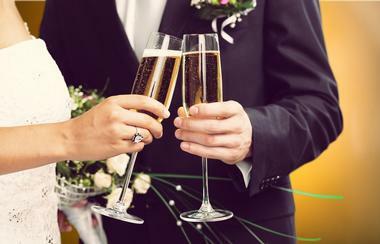 In order to have a wedding in Thailand you need to get an Affirmation of Freedom to Marry in Thailand at your country’s embassy in Bangkok; a translation of this document into Thai; and an authentication at the Thai Consular Affairs Office. Once you get that out of the way, the fun can start. Several hotels in Bangkok are popular wedding venues: these include the Grand Hyatt Erawan, the Siam Kempinski Hotel, the Peninsula Bangkok, the Sukhothai, the Plaza Athenee, and the most famous hotel in Bangkok, the Oriental. Bangkok offers a huge variety of accommodations from very inexpensive backpacker hotels and youth hostels to five star luxury properties. High season is from November to March, so book your room in advance. 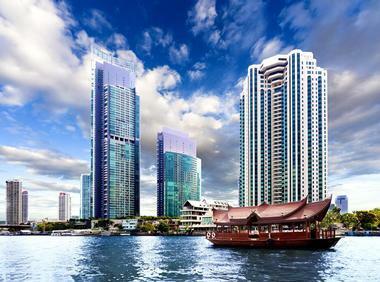 Bangkok is home to a large number of five star hotels including the Oriental, the Millennium Hilton Bangkok, the Amari Watergate Bangkok, the Banyan Tree Bangkok, and many more. There are many hotels along the river: some of these have pleasant views of the river and the river traffic. There are many hotels along Sukhumvit Road. Some of these are high-end properties but there are also affordable accommodations here.